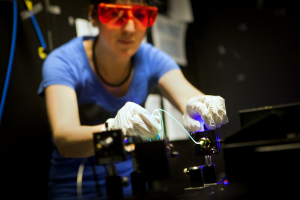 The field of Photonics is rapidly growing in Europe and other parts of the world. Photonics is a multidisciplinary field of technology, which includes various ways to generate, control and convert light into something useful. Optical communication by using optical fibers in conjunction with other electrical and optical components currently represents the main part of the infrastructure for the Internet. Photonics has been identified by the European Commission as one of the five most important key enabling technologies (KET) for the future economic growth in Europe. In the Mid Sweden area there are a number of unique research centers and institutes, which are actively engaged in collaboration with industry in order to enhance the competitiveness and economic growth. The objective in this research and innovation (R&I) project is to strengthen and expand the knowledge within fiber optics and laser technology in the Mid Sweden area. This will further increase the competitiveness and contribute to an increased economic growth for the collaborating partner companies. Laser technology is used in numerous applications within e.g. industry and healthcare where new applications are continually being invented. Optical fibers are increasingly being used in non-telecom applications for use as for example distributed heat, water sensors or high power light guides in the automotive industry. The small dimensions and flexibility of the optical fiber opens the potential to new application areas. Develop new fiber-based laser sources in the infrared region for applications in the regional industry. Develop new fiber-based laser sources in the visible (blue & green) spectral range. Develop a laser source in the ultraviolet region. Other activities are also included in the project, which aims to inspire more young people in the age 18-24 and especially young women to study and work with science and technology. Special activities and an intensive work with role models will be conducted to promote young people to initiate a career within science and technology. Photonics is a multidisciplinary field which offers endless opportunities and inspiring challenges in several areas such as healthcare, wood-, metal- and process industries.